Do You Believe That God Desires Your Success and Personal Fulfillment? Sometimes the biggest thing standing between us and our happiness and success is fear. Fear of failing, of not being good enough, of the unknown—even fear of success. In one of the stories in our FREE eBook Paths to Happiness: 7 Real Life Stories of Personal Growth and Self-Improvement, you’ll meet a man who had that exact problem. Read how he was able to move beyond his limited world and, through prayer, commit to a process of personal growth and self-improvement. You’ll read the story of a woman and the impact her obesity had on her son and husband. Learn what her “Aha!” moment was and how it became her critical turning point. And you’ll learn from a woman who, through crocheting an afghan, brought balance into her life by carving out time for pray and reflection. Her story, along with the others in our FREE eBook, can teach you that the simplest things in our lives can set us on the path to personal fulfillment and spiritual growth. There are situations in life that we all have to face at times: money problems, rocky relationships, feelings of emptiness or depression, family illness. In Paths to Happiness: 7 Real Life Stories of Personal Growth and Self-Improvement, you’ll find the stories of everyday people—people like you—who found the strength, courage, and faith within themselves to successfully overcome life’s obstacles. All these stories show that if you have faith, if you persevere, you can achieve success and happiness in life. Expensive cars. Big houses. Out-of-control spending habits. Many of us feel an urgency to acquire things we don’t need. Our desire for material goods often distracts us from tending to our emotional and spiritual needs. We wind up thinking that material things will bring us happiness. But they don’t. All these people were able to turn their lives around by embarking on amazing journeys toward personal and spiritual growth. Find the Faith and Hope to Unlock Your Potential for Personal and Spiritual Growth. Sometimes we encounter setbacks in our journey of personal growth. But just because we fail does not mean we are failures. Read how the people in our FREE eBook Paths to Happiness: 7 Real Life Stories of Personal Growth and Self-Improvement rose above the obstacles they encountered and transformed their lives. Sixty-hour work weeks. Calendars filled with more social obligations than you have time for. Emails to answer. Children to take care of. It’s easy to forget to take the time to reflect and feel connected to something larger. That’s exactly what happened to one woman in these stories. A demanding career, teaching Sunday school, sitting on the church vestry and raising kids…how could she ever find time to reflect and focus on her own spiritual growth? What she discovers will warm your heart. 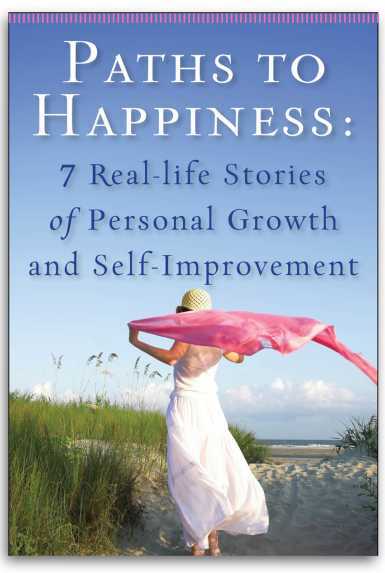 And so will the stories in Paths to Happiness: 7 Real Life Stories of Personal Growth and Self-Improvement. They show just how important finding a balance between everyday living and personal reflection is to a life of spiritual growth and self-improvement.